For uTorrent users: uTorrent, the most popular BitTorrent client, was found to be malicious recent days for the reason of being hacked (possibly) and has been blocked by Chrome. The newest version uTorrent 3.4.2.32354 cannot be downloaded in Chrome or any other browsers now. If you see the warning signal "This file will harm your computer", you'd better stop all the free uTorrent downloading process. This article is one of the many efforts aimed at bringing you the best uTorrent alternative software without malware or ads for movie torrent safe download on PC and Mac, since uTorrent is stuck in malicious threats right now. Both investigation and version update for uTorrent are being under way, meanwhile, to solve this issue. uTorrent was heavily favored by many people before, which, as a result, may lead to a big mess out there for its being blocked. I guess at this moment some of them would expect to have an uTorrent alternative free from malware rather than wait a long time for its renovation. Hope this best uTorrent alternative list arrives just in good time. BitTorrent Inc., the developer of uTorrent, said it would provide users a safer software by updating to new version, which you can free download as before, coming with much more new features. But evidence shows that there will be more waiting for the new updated uTorrent alternative, so we believe attention should be focused on looking at certainly, at least during this period of time, any good uTorrent alternative that can help you safely download movie torrent. In fact, there are reasons for you to take another look at uTorrent alternatives except for the safe problem. From user's feedback in tech forums, uTorrent installer comes bundled with malware, spyware and ads sometimes, which can be disabled but just not easy. "It installed a browser hijacker called 'Search Protect by Conduit'. It did uninstall relatively cleanly, but it also left its installer files in Temp which Malwarebytes read as well, malware." 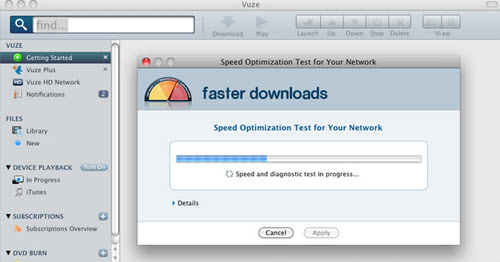 Vuze is a BitTorrent client written in Java, using Azureus Engine with flexible plugin system, which is the best uTorrent alternative for power users to download torrent files, as well as view, publish and share original DVD video. Pros: As the most advanced BitTorrent client, Vuze is the first one to feature DHT, which, however, you have to download and install a plug-in to handle, supported by several platforms (no iOS). Cons: Not so intuitive and resource intensive than other uTorrent alternatives. Besides, it contains a load of other programs. Choose custom install instead of default to uncheck unwanted boxes. BitComet might be the most controversial BitTorrent, HTTP and FTP download management software written in C++ only for Microsoft Windows users, which has been accused of many downsides but still is the first free uTorrent alternative choice for a lot of people to create torrents. Pros: A good uTorrent alternative for beginners for its ease of use, nice interface and preview mode. Cons: adverts, intrusions, bandwidth hogging and stalling. And some versions are tainted with malware that will load automatically and display advertising in the bottom. qBittorrent is a cross-platform free uTorrent alternative written in C++, using libtorrent-rasterbar library for the torrent back-end (network communication) functionality. Pros: qBittorrent is a clean and steady torrent client, having a really simple and functional interface, just like uTorrent. What's more, its system resource usage was the lowest of all uTorrent alternatives. Cons: This uTorrent alternative is banned on many private trackers for its feature of spoofing other torrent clients' peer-ids. And its built-in search engine, which should have been a "pro", requires installation of a special plug-in. The point here is our suggestion of some special uTorrent alternatives without malware or ads, based on above analysis of 3 popular alternatives for uTorrent. I guess you all know that it is illegal in many countries, like the United States, to use P2P torrent client to distribute copyrighted material without authorization. On the other hand, downloading movie torrent with uTorrent or regular uTorrent alternatives is by no means a safe way, which may leave you with a series of malware, ads, and virus problems. For HD movie enjoying, DVD is the best option. Or special uTorrent alternatives like WinX HD Video Converter Deluxe and Popcorn Time work too. The former one is actually a powerful YouTube downloader, which can download full movies from YouTube as long as you can find the resource, serving just as the uTorrent alternative. What you will found very surprising of this special uTorrent alternative is how much functions are integrated into it. Better than only downloading movie torrent, you can convert movies to any devices with supported formats, like iPhone, iPad, New Nexus 7, HTC One M8, Samsung Galaxy, AVI, MPEG, WMV, MP4, M4V, FLV, etc. Most importantly, there is absolutely no malware or ads inside it. How to Use Special uTorrent Alternative? If torrents download is not your only option for watching movies, you should give a chance to this special uTorrent alternative. Download WinX HD Video Converter Deluxe here and I will show you the precise movie downloading steps (example: download Guardians of the Galaxy full movie online). 1. Install your downloaded uTorrent alternative and get it started. 2. Go to YouTube website and click to play a movie video you like. 3. Copy, paste and analyze the video URL. 4. Choose the output format/resolution and don't forget to tick the "Auto convert" button if you want to convert the movie to a desired format or specific device. 5. Hit button Run and this special uTorrent alternative starts to download and convert the YouTube movie at full speed. Note: We advocate ripping/copying DVDs for personal use only. Please refer to the DVD copyright laws in your countries before doing so. WinX HD Video Converter Deluxe – Download and Convert YouTube full movies online as special uTorrent alternative.